Hello Linux Geeksters. As you may know, KKEdit is a text editor combining Mac’s BBEdit, Gedit and Leafpad. While it has interesting features like: jump to function declaration, search and replace via regular expressions, options for saving and restoring sessions, support for multiple bookmarks and source code highlighting, it is not an IDE. The latest version available is KKEdit 0.1.4, which has been recently released. For information about the latest release, see the changelog. 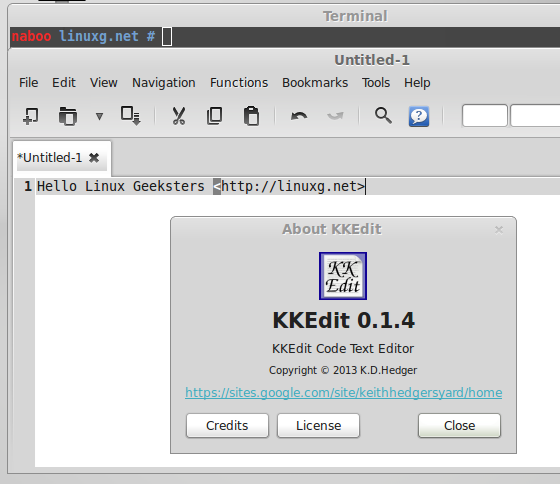 In this article I will show you how to install KKEdit 0.1.4 on Ubuntu 14.04 Trusty Tahr, Ubuntu 13.10 Saucy Salamander, Ubuntu 12.10 Quantal Quetzal, Ubuntu 12.04 Precise Pangolin, Linux Mint 17 Qiana, Linux Mint 16 Petra, Linux Mint 14 Nadia, Linux Mint 13 Maya, Elementary OS 0.3 Isis, Elementary OS 0.2 Luna, Pinguy OS 14.04 and Pinguy OS 12.04.